The Teacher Development Fund (TDF) aims to enable teachers and school leaders to develop their skills, knowledge and experience in order to embed learning through the arts in the primary curriculum. 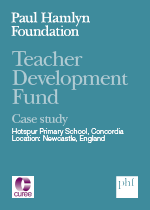 As part of its evaluation of the TDF pilot programme, the Centre for the Use of Research and Evidence in Education (CUREE) carried out case studies of four individual schools participating in this programme. This study looks at how a primary school with a predisposition to embedding learning through the arts in the curriculum used this approach to help improve pupils’ wellbeing, create a whole-school culture and ethos, and support students experiencing disadvantage. CUREE’s full evaluation of the two-year pilot programme is available here.